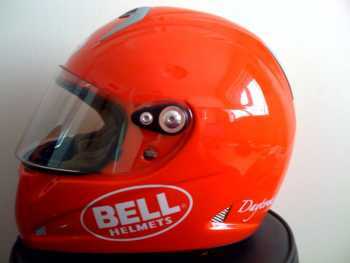 For my first motor cycle helmet review, let me introduce you to the Bell M5X Daytona. 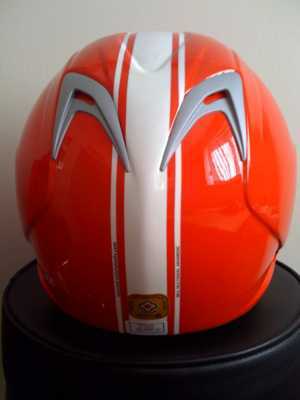 I recently bought one of these motor cycle helmets to replace my trusty old Caberg flip front which has served me well for some time now. 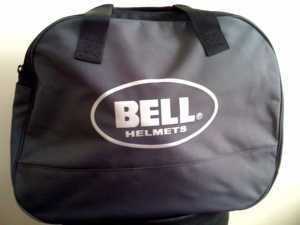 I have often fancied a Bell helmet and was pleased at the range of cracking lids released for 2009. Taking it from the box you are presented with its carry bag, but not any old sack for chucking the lid in but a proper mini holdall for carrying your helmet, spare visors etc. 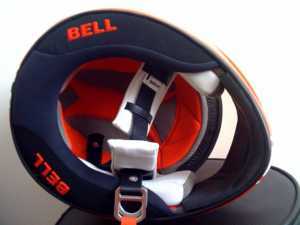 As you can see on the bottom the Bell logo is embroidered onto the neck cushion which is a nice quality touch. I think the overall look of this helmet is excellent. However if you are not keen on the red colour scheme, they also come in other variations, click on the picture at the top of this review to see them. The shell is dual composite aramidic fibre with an outer shell according to the booklet that comes with it, its build quality assures it with a SHARP 5 Star Rating for safety which can only be a real plus point. Fitting - trying the helmet on it is a very snug fit particularly on my oversize head! I would recommend measuring your head with tape and checking it against our fitment guide in our Webshop. I would also go slightly larger than smaller if undecided but that is just my opinion. It is nonetheless very comfortable and exceptionally quiet when riding. The visor is over 3mm thick! 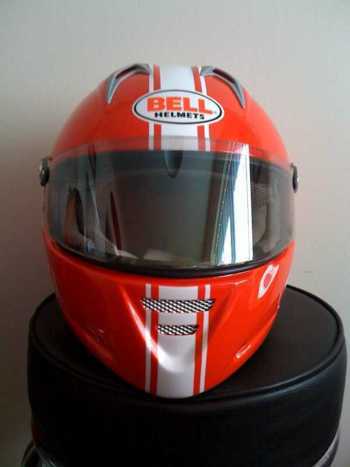 That's twice the thickness of regular visors I've seen and as a result of this sturdiness and Bell's fixing method you are assured of no rattles, visor fluttering or visor drop when riding with it in the raised position. Compared to a lot of more expensive helmets, this is pure quality and good looks, easy to use when riding, quiet, comfortable and great value for money. Click on the small picture at the top of this article to see it in our Webshop. 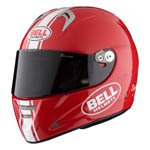 Visit the Bell webpage, click on the logo below, please contact us if you see anything you like, we will be happy to discuss.